The paper presents many “firsts” in computational protein design. It is the first de novo design of the beta-barrel fold (one of the most described folds in the past 35 years, yet mysterious until now). 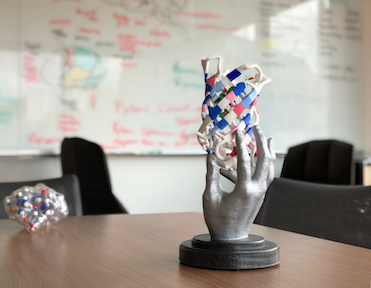 It is also the first de novo design of a protein tailored to bind a small-molecule, which requires very high accuracy in the placement of side chains on protein backbones assembled from scratch. Additionally, we could show that these new proteins could fold and function as expected in vivo! We hope that the advances described in the paper will further enable the de novo design of many biosensors and catalysts tailored for specific applications. Thanks to all the Rosetta@home volunteers who contributed to the validation of our designed proteins and binding sites. Here is the link to the IPD webpage that contains a copy of the paper. The work was also featured in the news articles below (the news in Science contains a video of one of our proteins glowing in living cells).